It will never not be exciting to see someone achieve massive, well-deserved success, especially when it's someone so genuine, creative, humble and kind like this MODERN SALON 100 honoree. Ashley Crowe, better known as her online persona @astrowifey, has created crazy-cool claws for the likes of Lady Gaga, Zoe Kravitz, Lily Allen, along with her local Chicago-based clientele. Most viral post: Probably my most viral internet post was getting featured on Buzzfeed as one of the 17 Nail Salons You Have To Visit Before You Die , I didn't realize how popular Buzzfeed was until I received text messages from clients and friends all throughout the day. Zoe Kravitz and Lily Allen both discovered me through that post! Favorite apps: Instagram because its really helped establish independent artists, it’s a great platform for growing a small business and discovering subcultures and talent. Artists have more freedom over their work. Tip to get best results on a post: I actually prefer to just go into posting being authentic and genuine, I don't really have a strategy but I am learning to embrace tips from social-media guru's like hashtagging a post and how to take better quality photos. I also tag everyone involved in the post because it’s important to show love back! And lastly, link your accounts like Twitter and Facebook page to your Instagram. Favorite professional beauty products: I love gel nail colors, my favorite brands have to be Presto, Ace and Akzentz gel. For cuticle oil I use organic jojoba oil because its closest to your skins natural pH balance and for skin I love Grown Alchemists Vanilla and Orange Peel hand cream. It’s great for both mani and pedis. How social media changed your life: It's really given me a platform to display my work, connect with other artists in my community and be a business owner. I become a better artists connecting with others in my industry because they inspire, teach and push me to grow and educate myself. That is priceless. The first time I was featured on MODERN SALON was…. 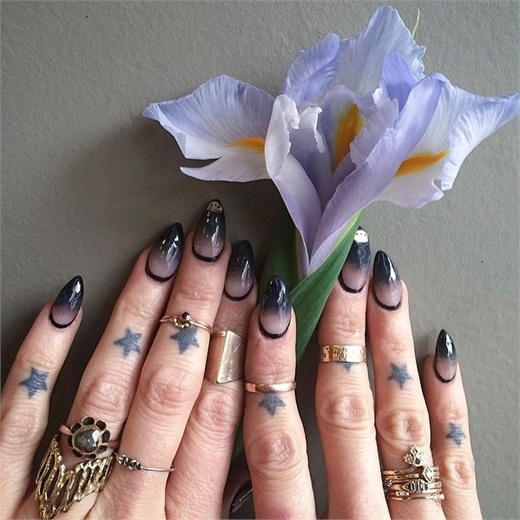 : On instagram when Modern Salon shared some of my nail art photos. I then did a beauty editorial with my friend @LashBeat, featuring HMUA Andrea C Samuels and photos by Jordan Fray. SEE THE FULL 2017 MODERN SALON 100 LIST HERE!